This is the third part of a series on Clifford Roberts, the co-founder of Augusta National Golf Club and the chairman of the Masters Tournament from 1934 to 1976. Read Part 1 and Part 2. CLIFFORD ROBERTS IS OFTEN REMEMBERED (and quoted) for saying about Augusta National Golf Club and the Masters Tournament, "As long as I'm alive, golfers will be white and caddies will be black." Today, however, it is difficult to find an African-American caddie looping at the Masters as all the pros (and amateurs) bring their own caddies, and they are, almost exclusively, Caucasian. (The first full-time white Augusta National caddie, around 1986, was Tripp Bowden who writes about it in his book Freddie & Me, Augusta National Legendary Caddy Master). In a 1997 article in Sports Illustrated Rick Reilly would write, "Someday Eldrick (Tiger) Woods, a mixed-race kid with a middle-class background who grew up on a municipal course in the sprawl of Los Angeles, may be hailed as the greatest golfer who ever lived, but it's likely that his finest day will always be the overcast Sunday in Augusta when he humiliated the world's best golfers, shot 18-under par (70-66-65-69, the lowest score in tournament history) and won the Masters by a preposterous 12 shots. It was the soundest whipping in a major this century and second only to Old Tom Morris's 13-shot triumph in the 1862 British Open." What would Clifford Roberts have said about that victory? Oh, by the way, Tiger's caddie was Caucasian, Mike "Fluff" Cowan. Roberts had been fighting to keep segregation most of his life. When researching his history for my novel, The Caddie Who Won The Masters, I read his interview about President Dwight Eisenhower at the Columbia University Eisenhower Library collection. In that interview Roberts states how upset he was by Ike's 1957 decision to send troops into Arkansas to confront Governor Orval Faubus in what famously was called, the "Little Rock Crisis." Roberts, a diehard Republican and a wholehearted supporter of Eisenhower, saw this move by the president as disastrous for him, his association with Augusta National, and, because, he said, the 'south' wouldn't accept integration, and Southerners would turn against Ike. Roberts would also claim in this interview that integration would "mean mixed marriages, and mixed marriages are the worst … the most worthless of all in every respect." Well, Roberts would not live long enough to be proven wrong, for Tiger Woods, the greatest golfer of his generation, with the greatest victory at Augusta, was the son of a mixed marriage. at the Masters 40 years ago. 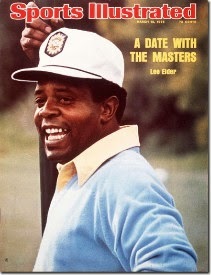 The first African-American to qualify for the Masters was Lee Elder who had won a PGA tournament the year before. Lee missed the cut, but he made golf history. In a 1995 HBO Real Sports special about the 1975 tournament Lee said, "I think that when I qualified, it really put him [Roberts] in such an embarrassing position that he wanted to do everything that he possibly could to, maybe, not make it comfortable for me to be there." Roberts had a long history of keeping African-Americans out of his tournament. In 1973, for example, 18 members of Congress spoke on the floor of the House to insist that Augusta National arbitrarily invite an African American to play in the Masters. They even sent a telegram to Roberts who replied that he was "flattered" and "a little surprised" that "congressmen would be able to take time out from trying to solve the nation's problems to help us operate a golf tournament." No African-Americans were invited to play at Augusta National that year, or any year. Roberts also quickly (and quietly) changed the rules for qualification for the Masters when he needed to keep African-Americans off the course. When Charlie Sifford was close to winning the 1962 Canadian Open, he was told, going into the fourth round, that word had just come up from Augusta that the Canadian Open winner would not be invited to the 1963 Masters. Previously winners of the Canadian Open did qualify, but suddenly a clause had been added that said "provided the winner was actually a Canadian." Sifford, of course, was an American, but then Ted Kroll, a white man, won the Open, coming from behind to beat Sifford. Kroll was invited to the tournament as a foreign golfer. Frank Hannigan, a long-time USGA official, wrote that "Roberts thought that blacks should be cared for decently, so long as it was understood they were servants or entertainers… Roberts thought there would be trouble in both the United States and England wherever people of color converged in large numbers." Hannigan went on to say Roberts's innate suspicions weren't confined merely to blacks or Hispanics or other people of color. "He regarded shortened Italian names as evidence of sinister behavior." In most ways, Roberts wasn't unlike many in the South. Bobby Jones, for example, was a good friend of the virulently racist, fellow Georgian and Augusta National member, Ty Cobb. It wasn't until 1990—nearly 60 years after the club opened, and shortly after the dispute erupted over the upcoming PGA Championship hosted by Shoal Creek Country Club that also had an anti-black membership clause, Augusta National announced Georgian African-American successful businessman Ronald Townsend had accepted an invitation for membership. And Ronald Townsend didn’t even play golf! In 2012, Augusta National finally tossed out their men only clause and invited two women to join as members. One was former Secretary of State, Republican and African-American Condoleezza Rice, who does play golf to a plus-20 handicap. How would Roberts react today to these changes at Augusta National? First black players, next white caddies and now women!